Are you one of those mothers who are always shopping for something for your baby? Well, guess what? You can use your knowledge and expertise to educate other mothers on what’s best for their children. 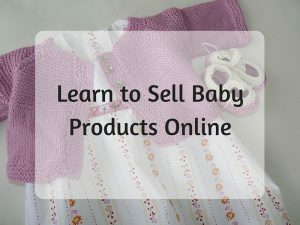 In this week’s niche tips, I’ll dig into the step-by-step on how to sell baby products online and hopefully, it will inspire some business ideas in you. The internet has provided parents a convenient way to do their shopping while having to juggle with work and caring for their children. At a glance, baby product sites offer more varieties, thus allowing parents to compare prices easily. Most mothers especially, prefer to buy based on recommendation and product reviews are a great way to show them the quality of a product without being biased. Generally, anyone with a vast knowledge or experience in using baby products can get involved. The common group of people that are most likely to be interested are stay at home moms/dads, baby caretakers and baby product retailers. You’ve probably heard me mentioning the word ‘niche’ multiple times already. What exactly is it? It’s basically a group of people that are interested in a certain thing. So in this context, they are consumers who are looking to buy a certain baby product online. It’s also worth mentioning that baby products alone is a very broad niche because it can consist of multiple categories. 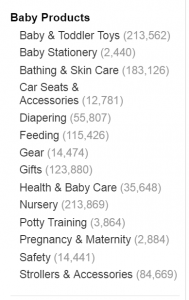 Just to give you an idea, here’s the list of the products that are available through Amazon’s Baby Store. There are 14 categories in total and each one easily has more than 2,000 product selections. So this is obviously a very vast niche. The good side is that there are a lot of choices, but on the downside, it’s more difficult to attract a specific audience. These people have done their research and they are ready to buy. The traffic is often times recurring because there are thousands of people who are looking for a specific item every day. Specificity could translate into longer keywords (more on this later) which you can use to rank in the search engines. It will actually make your site stand out from the competitors because it’s less distracting and people can focus on buying what they really want. Now that you have a niche in mind, let’s get started on some basic setups. (1) The very first thing that you’ll need is a domain and a website. A domain is basically the URL of a site and to create one, you simply need to go to a domain registrar to search if a name is available to use. At the Siterubix platform, you can get your very own domain for a reasonable fee that includes, privacy, protection and emails. Here’s an example of an interesting domain name that I’ve researched for a baby beddings niche. Right after you purchase the domain, you just have to connect to their hosting service and a WordPress website will be automatically generated for you within minutes. You could design and sell your own products. You could buy from a wholesaler and sell in an online store. Work with reputable brands through affiliate programs. However of all three methods, I highly recommend that you start with affiliate marketing because it’s the easiest online business model to adopt. Even if you get rejected for one application, there are hundreds more that can offer better opportunities. Here’s a list of baby products affiliate programs (and their commission payouts) that I’ve researched for you. If you have a brand that you personally like, but they don’t have an affiliate program yet, write to them and see if you guys can work out a mutual business agreement. There’s certainly no harm trying. (3) Now that you have some idea about what you are going to sell, it’s time to build traffic to your site with good quality content. In other words, articles or blog. But before that, we’ll need to do some keyword research using Jaaxy. One of the rules in choosing keywords is that you don’t go for something that’s too general because you’ll be facing with a lot of competitions. For example, the term “baby product” has more 399 competing websites. You would take forever to outrank that. Did I mention earlier that a specific niche could translate into longer keywords? When you think about a targeted audience, your keywords would become more descriptive. The advantage of this is that you’ll be faced with less competition and hence, people will be able to find your site better online. The term “organic beddings for babies” is a good example of a long keyphrase that only has 30 competing websites. Here are additional 13 low-competition keywords that can help you produce some good quality content, depending on what type of niche you are in. So, what does all these keywords have to do with the success of your online business? Simple. The better your articles ranked on the search engine, your site would get more visibility, traffic and most importantly, revenue. (4) After publishing your articles, remember to share it with specific communities on various social networks, related forums and reach out to other bloggers who are in the same niche as you. Meanwhile, encourage readers to leave comments on your blog as this creates a good user experience and adds to the overall quality of your site. (5) When you have more online traffic that are converting, you could venture into other entrepreneurial ideas such as eBook promotions, YouTube video tutorials and paid ads to expand the size of your audience. By now, you have probably figured out that baby products are hot items in the market. Well, considering the fact that there are more than 4 million babies born each year in the US, that’s not a surprising trend. In fact, it’s estimated that by 2018, there will be more than 6,000 companies joining the eCommerce platform to promote their products. Therefore, they will certainly need people like you to help with their product promotion. What I’ve just outlined in this post will prepare you for this much required skill and if you rinse and repeat the techniques, you could very much build your own business selling baby products online full time. Are you excited about what this industry could bring? Then join me at my recommended training platform to learn more about getting started. Hope to talk to you soon. Do you have any thoughts or questions about this awesome niche? Feel free to leave them in the space below and I’ll get back to you. Hi Cathy, what a great article. I have done most of what you have suggested however do you have any suggestions on where/how to find specific communities and how to get your blog in there? Hi there Rebecca, I found this link that points to a lot of communities inside Facebook. You might want to give that a try. Hope it helps. I really want to create an online business dealing with babies clothes. Do you know of any wholesalers for this? Thanks. Hi there Mercy, I see that you are writing from Australia. If you type ‘wholesalers for baby clothes Australia’, I am sure you’ll find some leads on Google. But to save you the time, here are some brands that you may be interested in; Bloom and Grow, OakieBaby and Stock My Store. I really enjoyed your post since I was doing a research on this subject. Perhaps you could give me an advise… I’m not sure if I can combine baby cloths, etc products with/or child development products. I think baby clothing and child development products are two niches that have very distinctive audience. One is about grooming and giving comfort to babies through clothing selection and another is about nurturing the growth of a child. When someone search for something on Google, they usually have a very specific intent and that two ideas that you mentioned don’t seem to complement one another. Hi Cathy, thanks for your information sharing. May I know more details about how affiliate programs work? I’m single mom and now looking for the ways to sell baby products. Welcome to my blog Shireen. An affiliate program is basically a partnership between you and a brand merchant. You would recommend products from this particular brand and when online visitors buy something through your affiliate link, you’d make a sales commission. The basic set up requirement is a domain name, a website/blog and basically a niche which you already have – baby products. There are plenty of companies out there that you can be affiliated with such as the Amazon marketplace or ToyRUs. If you like to give it a try, the Starter program at Wealthy Affiliate can help you get started for free. Once you sign up, I can guide you through the step-by-step. Hope to hear from you soon. Wow, that Google trends stats is very convincing! It has been a while since I used it. Baby products is a huge market and according to UNICEF, 353,000 babies are being born every day around the world, so there’s definitely a demand for this niche online. Creating a baby blog is something that I would consider when I become a parent someday. Wow! Well I would have never ever thought or even considered trying my hand at baby related niche. And there is very reason I ought to. It is one very popular niche that most definitely has some very long term potential. In fact, very much perpetual never ending niche. Great idea! I need to get my thinking cap on. Wow, some really great topics and awesome tips and tricks. I have already chosen a niche, but before I was really interested in the baby products business. I watched a video which talked about the cons of this niche and I just backed away because I felt like I was never going to get any traffic from such a competitive market. But now that you show me the steps, I am more convinced that I can do it. Definitely going to make a website on this. Thank you for the detailed explanation. Hey Shadis, I am glad I could help you there. There’s no reason not to get involved in a competitive market. If you know how to do a proper keyword research, you can drive traffic even to the smallest of niche. There’s absolutely a lot of opportunities out there and the more you search, the more you’ll discover them. Hi Cathy. I loved your post. As a mother to a couple of little angels, I agree that shopping online for kids stuff is much easier. Not only clothes, but baby equipment, furniture, toys, books, etc. It would be interesting for me to think about and maybe develop a business based on my experience of raising my own kids. Thank you for giving us all the information one budding entrepreneur might need to start in this niche. Thanks for those keywords for the niche. It gives me more ideas of what to look for and build around. Excellent tips for getting into creating a website and targeting. I don’t like how some merchants won’t approve your application. Is that because you will need to build up your site before applying to them? Yes Owain. Although a website is not a requirement in affiliate marketing, it sets you apart from the individuals who would use their affiliate links carelessly on ad listings and online forums. I think the merchants just want to see some level of commitment from your side before letting you promote their products. This is a great niche as there are always going to be babies and it looks as though you are doing very well with it too. There are so many lovely baby products out there to be had and you are right that it stops it being quite so mind boggling to have a lovely variety of products in one place on your website. It really does sound like an ideal niche for anyone interested in babies. I might consider it myself. Thanks for producing a very interesting and informative article. My girlfriend is looking to get into this exact market so thanks for all the info. She will have no problem getting started now. Your list of affiliate programs and the commissions that go with them is extremely helpful. I can see from your site that the baby and toddler toys market has huge potential so I think that’ll be the one to go for.